Graduate student Peter Christian has developed an unmanned aerial device to help researchers capture high resolution images of the natural environment. Known as a "hexacopter," after its hexagonal shape, this unmanned aerial vehicle (UAV) is the size of a model airplane and was adapted by graduate student Peter Christian to be used for aerial surveys. "Using UAVs opens up new areas of research that were previously too expensive to survey from the air or too difficult or dangerous to study from the ground," said Christian, a student in the Geographic Information Science master's program. He noticed that researchers are often constrained by what data they can feasibly collect. So for his master's thesis, he used the hexacopter to develop an aerial instrumentation platform, providing an affordable way of capturing high resolution images of the earth's surface, including landslides, vegetation patterns, wetlands and marine habitats. "With this new technology you don't have to depend on where NASA has flown in the last five years or go to the expense of hiring a plane for aerial photography," said Christian, who noted that UAVs have grown exponentially more popular among academic researchers in the last decade. 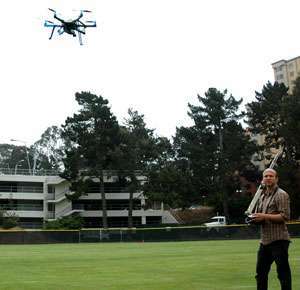 With funding from the University's Center for Computing and Life Sciences, the Geography Department purchased a ready-made hexacopter, a vehicle popular with hobbyists. Christian has spent the last year retrofitting the device, including adding a digital camera beneath its six propellers and adding shock absorption to improve the images captured. This UAV system cost about $4,000 to put together—a fraction of the cost of other research or commercial systems—and is already opening up new lines of inquiry for SF State researchers. Earlier this year, Professor and Chair of Geography Jerry Davis used the hexacopter to survey the shape of stream channels at a water-logged meadow in the Sierra Nevada. Christian continues to work with Davis at the meadow site and also plans to collaborate with his advisor, Leonhard Blesius, to study a small-scale landslide on the property of the University's Romberg Tiburon Center in Marin County. "The hexacopter is generating a lot of interest from in the Geography Department and among researchers in related fields," said Blesius, assistant professor of geography. "It provides high spatial resolution—you can measure a site in the order of inches and centimeters, and by taking photos from multiple angles we can create 3D elevation models of the landscape." 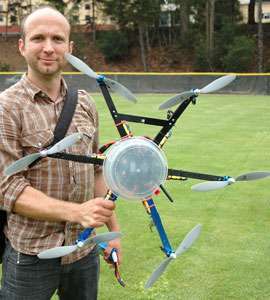 Graduate student Peter Christian tests out the hexacopter at Maloney Field on campus. Another key feature, Blesius noted, is that rather than piloting the hexacopter manually, researchers can program a flight path so that the instrument flies on autopilot, which increases the accuracy of the data collected. Christian's next step is to train other "pilots" in the Geography Department so that his creation will continue to benefit faculty and students once he graduates.